How can you keep a child’s sandpit clean? Sandpits are great fun for children to play in but it’s really important that you keep them clean; in order to make sure your child remains healthy and safe. You want your child to enjoy the sandpit experience and you do not want them to become sick as a result of playing on a piece of playground equipment. We are going to take a look at why it’s so important to make sure you keep your child’s sandpit clean. We are also going to give you some tips about how you can make this happen. If you have a sandpit for your child there is a good chance that at some point your child or your pets may decide to use it as a toilet. If your pet goes to the toilet in the sandpit there is a risk of your child being affected by toxoplasmosis. This can cause symptoms such as rashes and stomach upsets in young children. Obviously, you do not want this to happen. If your child’s sandpit is not kept clean there is also a risk that they could be open to injury from debris which has fallen into the sandpit. Any such injury is bound to spoil the fun they are having playing in the sand. We have taken a look at why it’s important to keep a sandpit clean; but how do you actually ensure this cleanliness? Here are some tips to help you make sure your child’s sandpit remains a safe and healthy place to play. Make sure that there is good drainage in place so that it’s easy for the sand to dry out. 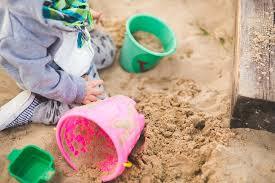 Make sure that the sandpit is always covered when your child is not using it. It’s worth noting that it’s not a good idea to use a plastic cover as this tends to keep the sand damp. The ideal type of covering is fine mesh. This prevents pets from using the sandpit as a toilet but keeps the sand exposed to the air. It also enables the sand to be washed by rainwater which is a good cleaning method, as long as good drainage is in place. Ensure that you regularly rake the sandpit and remove and debris that you can see. If the sandpit is not exposed to rainwater on a regular basis you should make sure that you wash the sand with tap water. If your child, or pet, does use the sandpit as a toilet you should disinfect the sand using mild diluted disinfectant. If you put these tips to use you should be able to keep your child’s sandpit clean. Hopefully, you can see why it’s so important to keep a sandpit clean, in order to ensure the health and safety of your child. It’s not that difficult to do and it’s worth taking the time to make sure your child has fun without getting sick. This entry was posted in Kids Care and tagged child, sandpit clean. ← What Supplies Does Your High Schooler Really Need This Year?